Polin Waterparks is a 43 year old waterpark company. We’re part of the Polin group. At Polin, we do design, manufacturing, engineering and installation of waterparks and water play attractions. We’ve completed more than 3,000 waterpark projects in 105 countries worldwide and have many patented signature rides. You might be familiar with our King Cobra, Magic Sphere, Space Shuttle and Spheres, as well as our RTM waterslide manufacturing technology, which has marked many milestones in the industry. Polin group serves as a one-point solution provider. Our aim is to extend our services to fully serve our clients and help them to integrate different entertainment channels. We want to be a one stop destination point for our clients, which is where our industry is heading. To achieve this, we’ve established multiple strategic divisions within Polin. The PGT division is integrating technology, interactivity and gaming into waterparks and water play attractions. As of March 2017, we’ve been a research and development centre, where 54 leading engineers are working on new technologies and projects. We focus on high-quality design and innovation patents. Polin Design Studio designs the most sophisticated ride types, works with the unique characteristics of each project, maximises the site potential and ensures the success of every project. Creating ideal conditions for surfing in a safe and controlled environment, any time of the year, anywhere in the world isn’t rocket science because of Polin’s ground-breaking technologies, innovative perspective and dedicated team of experts. 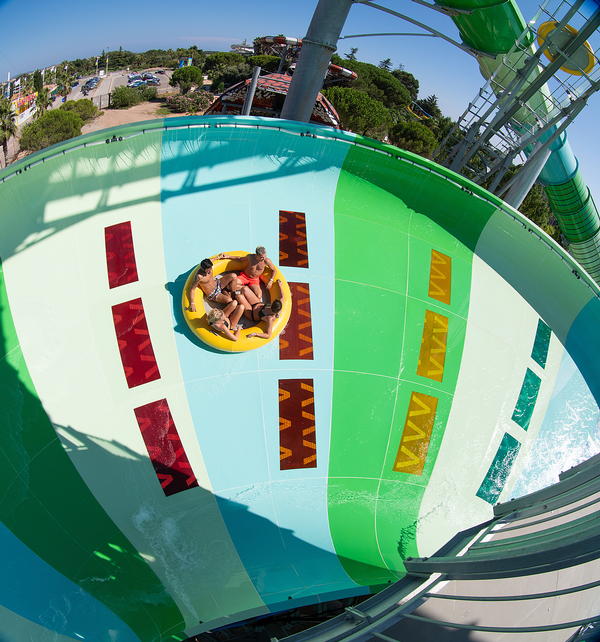 Polin Wave Parks can generate waves that will ensure hours of fun for guests. The installations are engineered for durability, ease of operation, maintenance, safety and fun. Polin has perfected hundreds of exclusive and successful projects all around the world with that attitude. This division of Polin is entirely dedicated to the design of aquariums, with all projects we undertake in this area including concepts, architecture and design, construction, business plans, procurement of the living creatures and brand identity development. Polin Aquariums aims to achieve excellence, with its team of experienced architects, engineers, biologists, veterinarians and technical experts. Debuted in 2016, Polin Aquariums’ initial projects are now developing into full-fledged installations. The division allows the company to serve up multifacted levels of expertise that let clients integrate an entirely new entertainment channel into their facilities. Polin’s oversight includes every imaginable detail of the installations, such as concepts, business plans, architecture, construction, procurement of living creatures and brand identities – all delivered by a team of experienced architects, engineers, biologists, veterinarians and technical experts. Pushing the boundaries of storytelling in waterslides, every detail in the design of the Stardust Waterslide supports its mysterious story and delivers guests on a daring journey. Using a unique, streamlined geometry, the expertly engineered waterslide allows guests to impact their journey throughout its ellipses and orbits. Guests’ weight and movement directly affect their raft’s speed and course along the slide’s path, delivering endless alternatives as they approach the drop section. The result is a journey so unexpected that, as guests exit the ride, they will be consumed with an urgent desire to start the adventure a new. 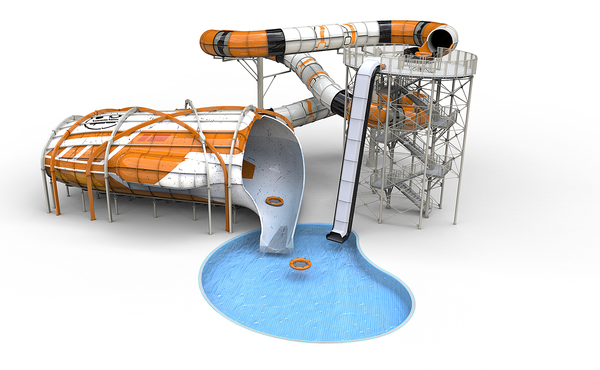 The engineering accomplishment of this slide – delivering a “multipoint entrance” to the drop section – is a significant, ground-breaking accomplishment within the waterslide-design industry. It’s also one more substantial example of Polin’s customer-oriented, adaptable and efficient understanding of design and engineering. 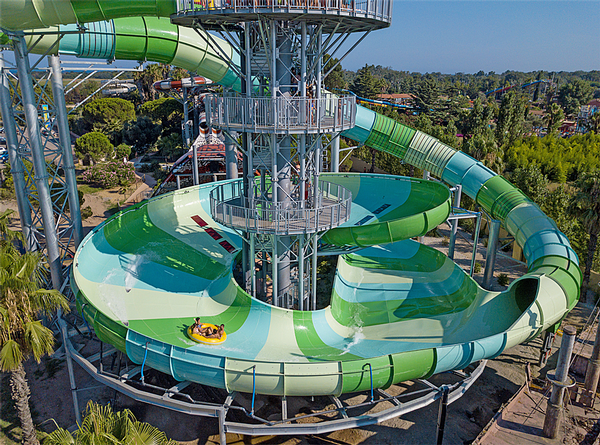 Just opened at Aqualand Frejus, France. Storm Racer incorporates a variety of key features that set it apart from other waterslides on offer: unique geometry, high capacity, a pioneering ride configuration and an exclusive, interactive “watersplash” feature that ensures intense competition and blasts of adrenaline. Storm Racer perfectly exemplifies Polin Waterparks’ expertise in engineering, R&D and technology integration into its signature rides. As rafts shoot to the top of the slope, Polin Waterparks’ exclusive watersplash sensors detect the exact high point reached by the raft. The sensors are connected to a lighting system that displays results on a score board to create a competitive element for riders. 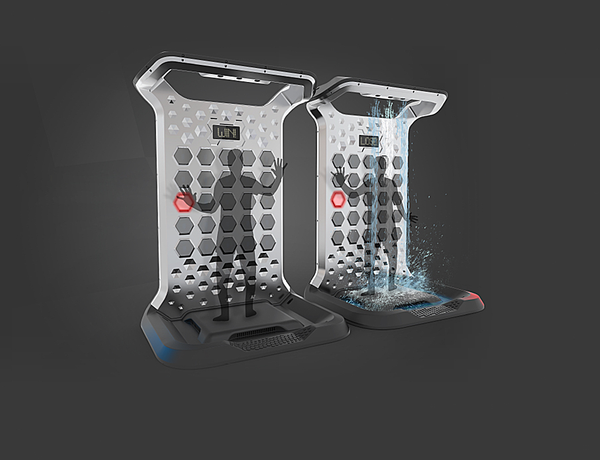 At each level, the lighting system showcases another colour and, if the raft makes it to the top, the Watersplash feature activates, and water splashes over the riders. Winners can be determined based on each hour of the day, day of the week or the entire season to ensure months of competition between teams. Head to head competition in stunning interactive splash challenge Splash Bucket is a one-on-one interactive splash game to see who has better reactions. Players must tap the lit buttons as fast as they can when lights appear on the wall. If successful, their competitor is splashed by nozzles embedded on the wall and also by water splash at the end of the game.